Doug Johns - Exeter CAACU and Club, 1959. Having arrived with the April showers, and, made home in a Caravan in the middle of a field adjacent to the Aerodrome at Exeter, we spent a few days reaquainting ourselves with the City and local area. The April showers proved to be virtually the last of the rain for some considerable time in 1959, and a glorious summer was in prospect. I made my way over to CAACU to let everyone know where I was living, and, to check on the flight program, called into the Tower to ensure that my wandering across the grass and crossing the runway enroute to work was OK, and that when they saw me the first time, they wouldn't think I was a rambler who'd misread his map! I also called into the Club and offered my services should they need more instructors, and to my delight found they did, and after a check, was set to work. There are occasionally, people who have log books full of flying hours and exotic aircraft, who turn out not to know an aileron from an actuator, so a check flight is always made! I see that, from my logbook, I flew four instructor sorties on May 5th in a Tiger Moth and a Chipmunk! May 6th started with the required demonstration of ability in a Vampire with Flt Lt 'Curly' Curtiss from the RAF Central Flying School, followed by taking the aircraft back up to get my hand back in, with a practice 'flameout' (engine failure), aerobatics, circuits and local flying. The following day more general practice including a QGH, which is the fighter pilots means of finding an aerodrome in bad weather, as the fighters of those days had nothing but a very basic radio and no 'aids' which could tell you where you were. It's based on 'direction finding' from the ground, using a rotating 'loop' aerial in the early days, superceded in the 50's by using a cathode ray screen (CRDF), which, when the pilot transmitted caused a line on the screen pointing to his bearing to (or from) the Station - QDM or QDR - and that was given to him to steer to arrive over the top. When the signal went round to the opposite side, he was overhead, and down he came outbound, turning at half height plus 2,000 ft, tracking inbound until in sight of the 'field'! It was often practised as a 'speechless QGH', which was indicated by four 'blips' on the transmit button. The ATC controllers knew it well, and would immediately call 'speechless' to transmit, give him a steer, and then ask questions answered by one 'blip for Yes, two for No, and the pilot often indicated engine failure as well! The controllers were so skilled, that, they would have you in a high downwind position and lead you to a 'flameout' landing virtually every time. A skill, I suspect, lost in these days of modern electronics! 1959 however, was not going to be a summer requiring anything other than visual approaches! That same evening, I also flew a Tiger Moth with a pupil doing circuit work. The primary work for the Vampire, was in the training/retraining of radar operators, using, I gather, fairly ancient radar equipment, so that expressions such as " You are entering my dark area" (I can't see you) were fairly common. Mainly carried out in what are termed 'practice interceptions' - PI's - where one aircraft is vectored on to another (the enemy)! There were other specific tasks with, and without radar, one for instance to demonstrate the dropping of 'window' (foil strips), used during WW2, to confuse radar with a blanket return. A Lincoln (big brother of the Lancaster) bomber dropped the 'window' and I was the 'target'! We also worked with the Army gunnery ranges for ranging, etc, but, although capable of towing a banner behind the dual Vampire T11, it would be on a fairly short line - used in fact for 'air-to-air' gunnery by other fighters, but, the Mosquito had a long steel cable which gave a fair distance to the 'banner'; even so, I remember the story of the Mosquito pilot, who, seeing the puffs getting a little close, said over the RT, "I'm pulling this b....y target, not pushing it!" The civil aircraft were far fewer in those days, and the extensive controlled airways system today, in it's infancy! There was occasional medium layers of cloud (stratus) , and as we worked all over the southern part of Britain, I remember under radar, with the ancient equipment, coming through a thin layer to find myself in loose formation with a Viscount. The De Haviland Company, started in 1920 by Geoffrey de Haviland, were the creators of the Exeter CAACU aircraft, the splendid Mosquito and the Vampire, and two of the Exeter Club's aircraft, the Chipmunk and the Tiger Moth. The Company produced elegant machines which looked right and were a pleasure to fly. The distinctive shape of fin and rudder on the earlier aircraft was instantly recognisable as a DH symbol almost, and in the case of the Vampire, was not much bigger than a pocket handkerchief. The DH Company was always at the forefront of design, which meant they sometimes had the misfortune of learning with the early jets, new lessons. The Comet is a classic of course, as well as the sad loss of the DH110 with crew at Farnborough. 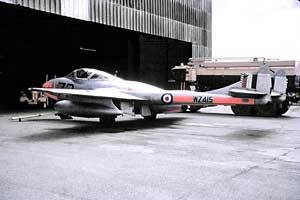 The Vampire, together with the Meteor, later to fly at Exeter, required much to be learnt in the operation of very basic jet engines and the aerodynamics of the aircraft itself. I wont go into the steep learning curve required, which was the cause of most of the accidents that occured in those days, as this is about 'memories' specifically in and around Exeter, but sufficient to say that the Vampire required respect and care in operation, otherwise it could 'bite'! To demonstrate how basic the aircraft were; the 'fuel control valve' was prone to stick - reduce power, open the throttle, nothing happens! To overcome this, good old British engineering was used. A button in the cockpit, when pressed energised a solenoid, causing a small hammer to tap the FCV. If it doesn't work, 'thump it' often does the trick, it also doesn't answer back as the modern computer does, telling you that all's fine as it flies you into the trees as you frantically try to disconnect it. Remember 'Hal'! The pilots on the CAACU were all ex Airforce or Naval (ATA, etc., as well), but, they came from different flying backgrounds. A couple of incidents I remember, although the Pilots Notes state that aerobatics should not be performed with droptanks, those of us who were ex fighter command, when the drops were empty - they fed first - used, on the way home, to aerobat using positive G and smooth movements. We were seen by one pilot, who decided to follow our lead but still had some fuel in the tank/s - result, whatever he did, resulted in one tank trying to align with the wing! He got back OK. Another incident, I led a formation take off with a pilot who I discovered didn't like formation flying. The lead aircraft at all times only uses the mid range of power settings, which allows those in formation to use slightly more, or less, to maintain station. On this take off, I noticed he had dropped back on the runway so I delayed the power setting to allow him to close - which he did by hurtling past me! The aircraft were getting old, and on one occasion I had the hood winding handle come 'off' in my hand; another time I took off with only the blue sky and the very top of the hood of the lead aircraft visible, as my seat collapsed leaving my head almost level with my feet! Once airborne, no problem, as I dropped below the lead aircraft, loosened my straps, took the weight off the seat and heaved it back up! The Mosquito, the wooden wonder faster than any German fighter of it's time, was always a pleasure to see and hear! The Germans tried to build with wood, and the glue came unstuck; the Americans said it's impossible, but in those days there were Brit's who said, 'nothing's impossible'! They still exist, but mindless bureaucracy and lack of money due to the stealing of most of it by the bankers, has surpressed the inspiration and inventiveness in this Country. The Exeter aircraft, together with some of the pilots, were featured in various films of WW2, and interestingly I note, that, Frederick Forsyth, the well known author, was a very young Vampire pilot in 1959, and wrote his book 'The Shepherd', where he is guided to safety by a ghostly Mosquito! He seemed to be unaware that there were still many very material ones still airborne! 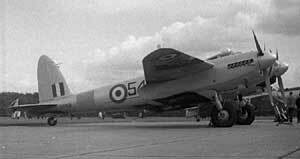 The cable used by the Mosquito's, to tow the target for the Army, was let out and retracted by a winch as it extended some considerable distance. On one occasion it wouldn't retract, and the guillotine used for a case such as this attached to the winch, also refused to work! Result one Mosquito with a lot of extended cable approaching to land, straddled some of the high energy pylons on the City side of the airfield, which put a few lights out. If I wasn't flying Vampires, I was airborne virtually every day in a Chipmunk, Tiger Moth or Auster. I often collected mushrooms on the way to work, and cooked them in the evening. The beach and City beckoned occasionally, but my wife had the use of the car as I didn't need it, and Mue got out and about as she wished. Phyllis and Leslie Tavender, the farmers who owned the field, were wonderful company, and two year old David made friends with the pigs. Life when the sun shines, can be very pleasant in a field! The Club had various events, and one that sticks in my mind, was a 'spot' landing contest for those who either had PPL's or reasonable solo experience. Those of us judging who had landed closest to the spot from a glide approach - once you closed the throttle at circuit height, apart from an engine clearing burst, it remained closed - were not too impressed by an aircraft a good 20 feet up and stretching the glide - still 20 feet up, when, the inevitable happened almost at our feet, he stalled, and, nose dived into the ground. No one hurt but the poor old aircraft, and it was decided that an instructor would fly with each contestant - mute, unless it was getting out of hand! It was in many ways, an idyllic life, although salaries wouldn't buy you a yacht, or many coffee's today, but without the usual Service duties, and doing what you most like best - getting airborne, and being surrounded by splendid people in a wonderful part of Britain! As the summer reached late August, those flying for the summer period, carried out their last flights - mine on August 27th, although I flew on the Club until the 30th. The weather remained good, but the occasional 'front' went through, as, on the way back from London area to Exeter I remember, from around 20,000 feet, remaining just below a solid sheet of cloud causing me to slowly descend, as a ' front', which was a meteorologist's dream of a perfect 'warm front', came through, seldom seen in the UK as they are by then tending to break down. September 1st saw me commute to RAF Chivenor, in North Devon, where until December, I, with Roger Helier an engineer, ran the 'Puffin Club'. A fair amount of flying in an Auster and a Magister was flown, and I knew that Winter had arrived, when in late October, having flown the Auster to Exeter for maintenance, I set off the following morning with the sun shining, to see dead ahead, a solid mass of black rolling cloud and heavy rain. Dropping down to just above the road, I followed the road I knew well to Barnstaple, then, skirting the airfield, which was a Master Airfield, and, as I had no radio was unaware of any traffic, a check on the windsock, and a turn into wind to land on the grass alongside the goalposts. Roger told me that he'd rung Exeter to let them know the change in weather, but I'd already left! Any excuse for low flying! So, in December, I sadly had to upsticks from an Exeter field, whilst, a one-ton lorry arrived to tow our Caravan to Elstree, where I had obtained a job with the new London School of Flying. Just over five years was to pass, before I had the pleasure of returning to Exeter and the Airport! 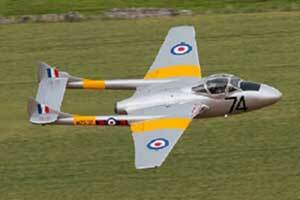 Doug John's memories of flying with the CAACU in 1959.